Mesh watch bands are, as their name says, watch bracelets made from metal wires (usually stainless steel) worked into characteristic mesh look that can give either robust or sophisticated look to watches, depending on the type of the mesh. In terms of durability, mesh watch band is made to withstand a lot. But this requires a bit of history, for those unfamiliar with their origin. 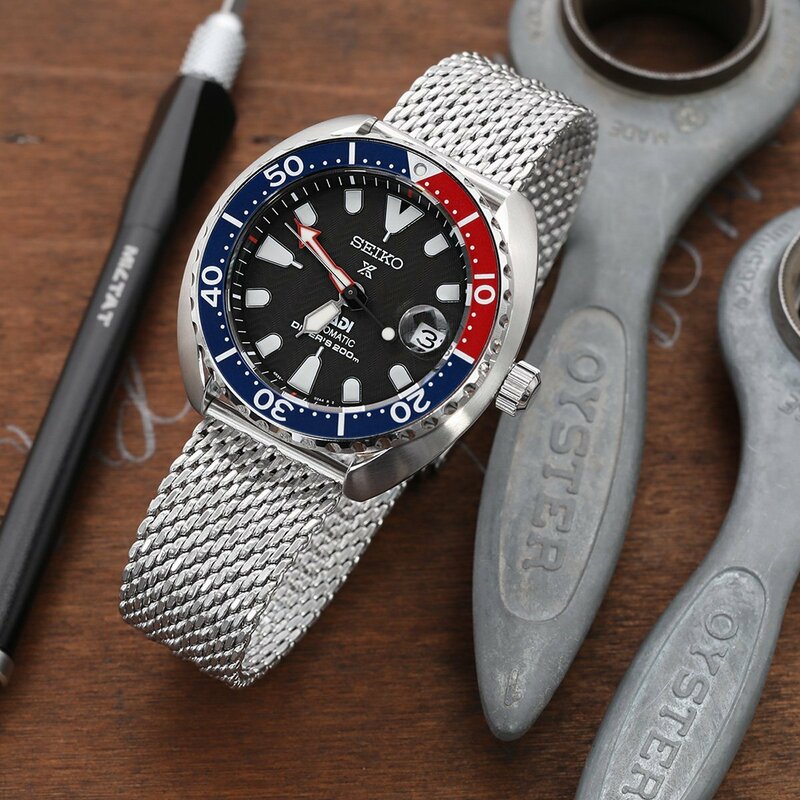 Mesh watch band became especially popular in 1970s, along with the Omega Seamaster Ploproof 600m, a watch made to withstand large pressure that professional divers may experience. It’s mesh band was advertised as "Shark-proof" and therefore named Shark Mesh. 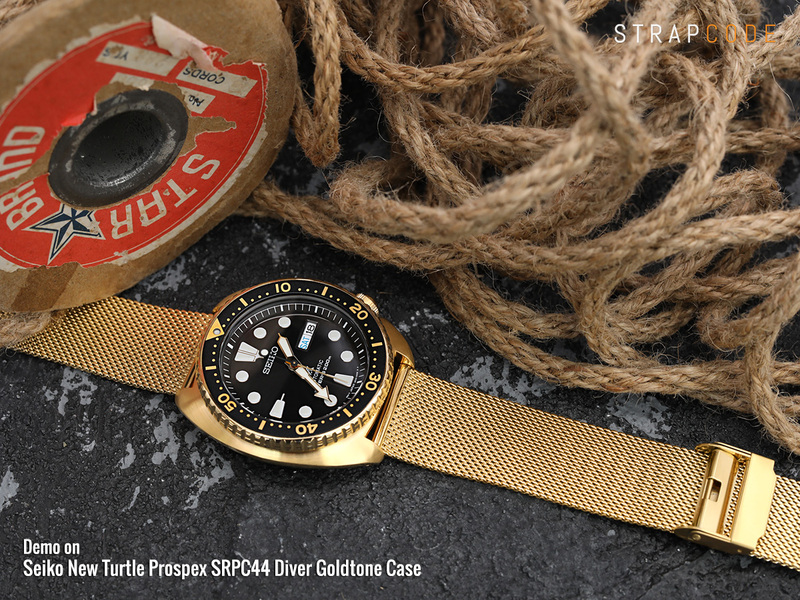 Although the bracelet was not truly prone to shark bites, it was more robust than standard watch bands because it had no pins between its links and intertwined loops of its mesh made from stainless steel. As Omega Seamaster Ploproof 600m was one of the largest, heaviest and robust diver’s watches ever made, its Shark mesh band was no less, and yet it had great breath-ability due to the space in its loops. Today, most mesh watch bands have small links, but Shark mesh had extremely large ones, in order to hold the glorious watch. But Shark mesh still tends to be quite popular due to 2016 Omega Seamaster Ploproof 1200m, which is the upgraded version of its predecessor. The new Shark mesh version is also upgraded with diver’s extension up to 26 mm in order to fit over a wet suit. Traced back the history, Milanese Mesh appeared much longer time than Shark Mesh. Milanese mesh bands, called by the Italian town Milan, where they originate from. Milanese mesh straps are known by the unique design of the mesh work, which gives the distinctive look to any watch they’re combined with. The design can be traced back far to the 13th century, when it was used as a special chain-mail. The production is completely handmade and is a specialty of this region for centuries. The design is specific by dense and tight mesh, which makes them especially smooth to the wrist. In the 19th century, the Milanese mesh design was also being used for watch bracelets. Milanese mesh watch straps are a real classic, especially because they were popular in the middle of 20th century. Around 1920s, German watch straps manufacturers, Staib and Vollmer, started producing mesh watch bands and so they appeared on a lot of vintage watches. They remain popular to this day, on both vintage and modern watches, as their design makes them real chameleons. For example, brands like Skagen and Breitling have used them back then and still have magnificent offer of mesh bands of Milanese type. The best proof was the bracelet that came with Breitling's SuperOcean Heritage series of watches and continues to follow modern editions such as Breitling Superocean Heritage Chronograph 44 Men's Watch pictured below. Milanese Mesh watch bands are usually made of thinner wire than other mesh straps. Besides main differences between Milanese and the classic mesh watch bands, Milanese's length is adjustable, while it’s a rare occasion for the later. For example, the first Shark mesh wasn’t adjustable, but luckily, the new edition has divers’ extension so it can be adjusted. As one of the main concerns before buying one of the mesh bands is if these kinds of bracelets are hard to clean, the answer is no. A slightly dampened lint-free cloth or a ball of cotton will go a long way without ruining the protective coating, just make sure you leave your bracelet to dry on air after that. 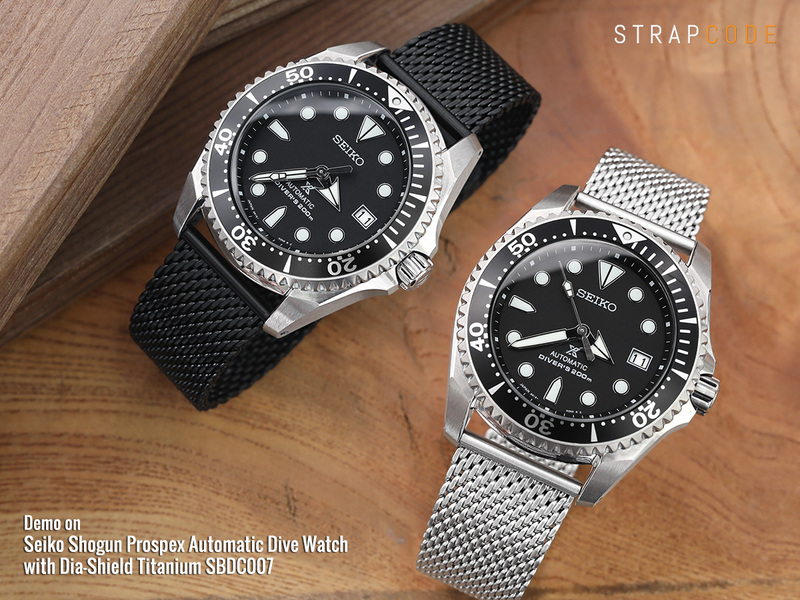 Now let’s see some of the great pairs of watches with mesh bands featured in Strapcode's collections. Please note that all of them are adjustable by length, in order to broaden the possibilities of combinations. Starting with the thickest and heaviest among them all, there's our Massy Mesh Band collection with screw details for adjustment. They are a perfect fit for heavier and larger watches. Mesh Band is a great hit in the watch band history and it is considered to be everlasting. One of the hot picks is the solid end-link heavy mesh with an outstandingly powerful appearance. What we can see on the picture above is our 22mm Solid End Massy Mesh Band Stainless Steel Watch Bracelet, Submariner Diver Clasp, Brushed [MC221805B002B] combined with Seiko Professional Titanium 600m Ashtray Diver Watch 7C46-6010. Classic Milanese- is a collection of classic mesh watch bands for the classic look. As you can see below, a classic Milanese mesh watch band such as our Classic Vintage Knitted Superfine Wire Mesh Band, Brushed [MB2220FYB041] look great on vintage style watches such as Seiko Recraft SRPC13K1 Blue Cushion and [MB2220FYBBK041] Seiko Recraft SRPC16K1 Gold Cushion. Tapered Mesh- are 4 mm tapered mesh watch bands from lug to the buckle. As you can see on the picture below, left we have 22mm Tapered Milanese Wire Mesh Band, PVD Black [MB2218FYBBK043] made from densely knitted 316L stainless steel wire and looks great on both modern and vintage watches. 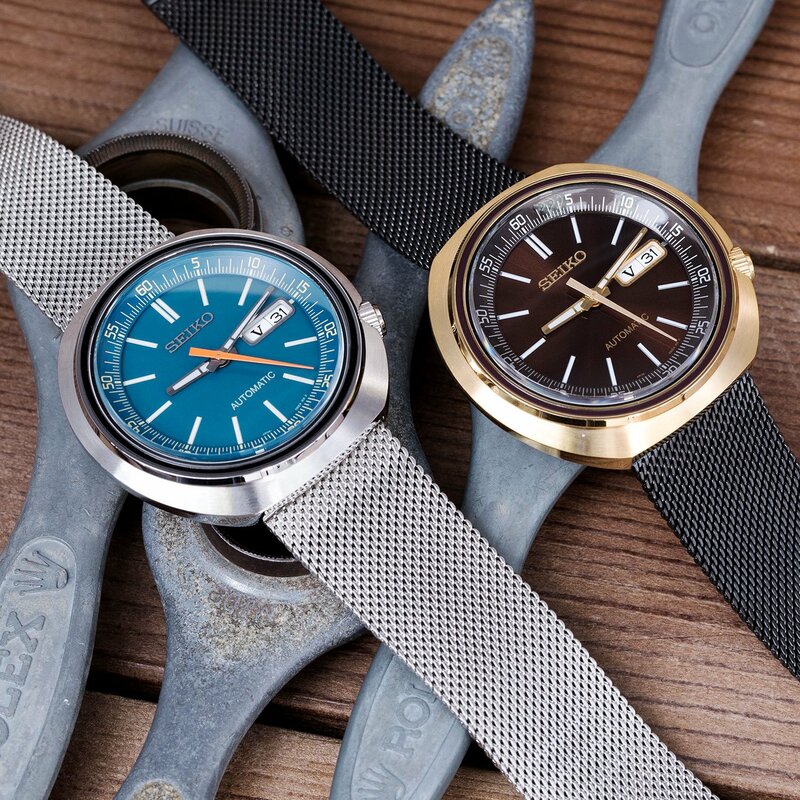 On the right we have: 22mm Tapered Milanese Wire Mesh Band, Brushed [MB2218FYB043] that gives truly vintage look and perfectly matches vintage style watches, both demo onSeiko Shogun SBDC029. Superfine mesh- densely knitted mesh bracelets made from superfine stainless steel wire for more fancy look. Inspired by the 70's, the craftsmanship of this fine mesh bracelet is quite delicate. The glorious demonstration below is our 22mm Classic Vintage Knitted Superfine Wire Mesh Band, Polished IP Gold [MB2220FYPGD041] obviously stating why these watch bands don't fit into just one era of wristwatches, demo on Seiko Gold Turtle SRPC44. All of the Milanese Mesh watchbands are adjustable by length, that's why Milanese Mesh type is so attractive to the public. Mesh watch bands are designed to last. And this is especially important for those who spend time in harsh conditions, such as water or heavy climate. The simplistic, mesh design fits both modern and vintage watches. As they say, if you don't know what to do, go classic. Mesh bands will always add a sense of classic style to any wristwatch. Mesh watch bands come in several thickness, sizes and it's possible to find any bracelet fitting literary any wristwatch. You get the most for your money. In terms of durability, feel and look. They look great on watches and may as well compliment any style, from sport to classic. Mesh watch bands will probably never go out of fashion. The fact is, they were huge thing on vintage watches in the last century and they are super-popular nowadays, with modern gadgets such as Apple watch and other so called smart watches. So, what's your favorite combination when it comes to mesh watch bands?